When the rich need saving, don’t despair, call Super Bush! When the poor need to be stomped on, don’t get your shoes dirty, call Super Bush! When the middle class starts getting curious, don’t cut and run, call Super Bush! 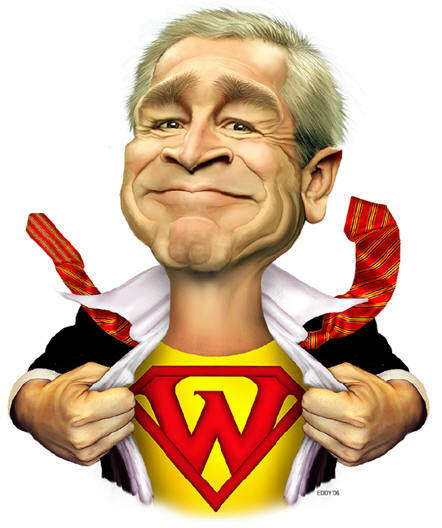 When we need to demonize socialism for all but demand it for the super-rich, don’t bother calling, he’s already there because he is Super Bush! Look in the sky, it’s an a-hole, NO, it’s a dictator, NO, it’s Super Bush! H/T to A Dark Dog for the picture. Haha, never seen it before but now that you mention it, there is a bit of a resemblance Stefanie. At least you think of cartoons when you see Bush, I image that eases some of the pain from this administration. When I see Bush all I think of is how much better off we’d be with an Inanimate Carbon Rod in the Oval Office. Ahh, a Simpsons fan, are we? Now every time I see Bush I’m going to think of an inanimate carbon rod, lol. Probably would make a better president, I agree. Yup, big fan especially those first 10-15 seasons. Homer Simpson is responsible for some of the best knowledge I’ve picked up in this world! I’m enough of a dork that I quoted him in my high school yearbook and don’t regret it. To alcohol, the cause of, and solution to, all of life’s problems. Heh. I’m a huge fan, too. Quoting Homer Simpson does not make you a dork. Ok, maybe it does, but it makes you a cool dork. Hehe…I’m cool with being a cool dork. In fact, my step-bro once told me I’m the dorkiest person he knows and I took it as one of the best compliments I’ve ever heard! Hey, check this out, it’s a random Homer Simpson quote generator. I’m gonna lose some productivity to that site! AHHH. Donuts… What can’t they do. Ha, you’d think I was a fatty. Purple is for sure a fruit. Homer’s internal dialogues are great too. Homer’s Brain: Twenty dollars can buy many peanuts! Homer’s Brain: Money can be exchanged for goods and services! If he had not run the economy into the ground, sanctioned torture, and got us entangled in Iraq, your poem might be funny. True Kermit, though I tend to try and look for the silver lining and this poem was all I could find!